Joined by his friend and guide runner, Joseph Kibunja, Paralympics champion Henry Wanyoike visited the Beirut campus recently and shared his story. Henry Wanyoike (middle) recounts his story, flanked by his guide runner Joseph Kibunja and Dr. Tarek Na'was, Dean of Students in Beirut. The crowd listens carefully to Wanyoike's inspiring story. 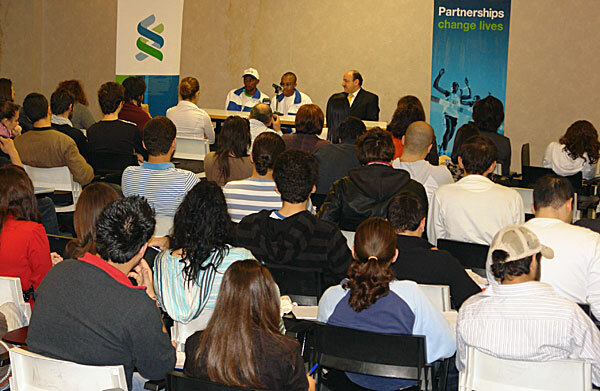 Triple Paralympics gold medalist Henry Wanyoike visited the Beirut campus on November 26. Joined by Joseph Kibunja, his friend and guide runner, he shared his experiences of overcoming his visual impairment and sent a message of hope and inspiration. “It is common to hear about people losing their eyesight. It is a bit uncommon to know of people who have managed to live a normal life when they have lost their eyesight. 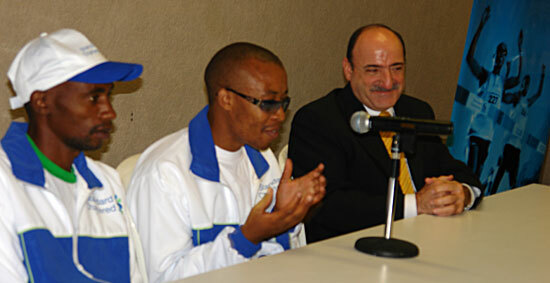 But it is totally uncommon to know that there is an Olympic champion who is blind,” said Dr. Tarek Na’was, Dean of Students in Beirut, when introducing Wanyoike to the audience. When he was a child, Wanyoike used to run to and back from school, which was 5 km from his home. As a student, he represented his school in several national and international tournaments. In April 1995, at the age of 21, Wanyoike woke up blind after a stroke. “When I was still in bed, I could hear the children playing outside and was wondering why it was still dark. Then I came to realize that I had lost my sight,” he said. That night, Wanyoike lost 95% of his vision, and gradually lost the rest over the next few years. “In the beginning it was very painful, very frustrating and very depressing,” he said, admitting that he even thought of committing suicide. After trying in vain treatments in various hospitals, he joined a rehabilitation center, where group therapy helped him a lot. “It took me three years to accept that I had to change how I used to do things,” he said. Hitting rock bottom didn’t deter him from pursuing his childhood dream of becoming one of Kenya’s leading track athletes. He learned how to run with a guide runner, and his first major achievement came in the 2000 Sydney Paralympics where he won the gold medal in the 5,000 meters. 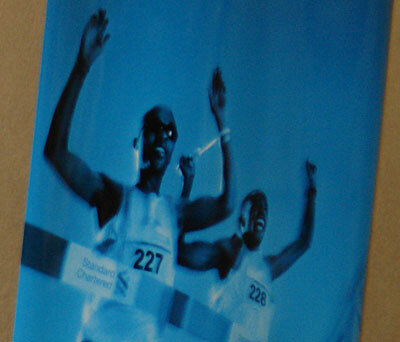 Kibunja became his running partner after Sydney. Since then, the two have participated in numerous championships around the globe beating world records and captivating those watching them cross the finish line side by side in the marathon, half-marathon, 10 km road race, as well as the 10,000, 5,000 and 1,500 meters. The Athens Paralympic Games added two gold medals (5,000 and 10,000 meters) and the Beijing ones a bronze medal (5,000 meters) to Wanyoike’s list of successes. In his LAU address, Wanyoike urged students to work hard, be disciplined, believe in themselves, and never give up even when they fail. “Life is never smooth. It’s like a marathon. It has its ups and downs,” he said. “You can turn yourselves into champions in your own way. You can make yourselves heroes,” he added. Having received support from the community, Wanyoike has felt the need to give back. 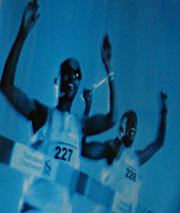 He has run in many marathons across the world to raise funds and awareness for preventing and curing blindness. Sponsored by the Beirut Marathon Association and the Standard Chartered Bank, Wanyoike was in Lebanon to participate in the race and in fundraising for Standard Chartered’s “Seeing is Believing,” a campaign that aims at raising money for sight-restoration projects.